Details: Dog - Arden Grange Adult Large Breed Dog with Fresh Chicken and Rice Arden Grange LARGE BREED ADULT with fresh chicken and rice has been specially formulated to meet the nutritional needs of large breed dogs, with a larger kibble size and increased levels of Glucosamine, Chondroitin and MSM. The formulation helps to maintain supple, strong joints and cartilage so important in large and giant breeds. All Arden Grange products are hypoallergenic and free from wheat gluten, dairy products, beef and soya. They contain no artificial colourings, flavourings or preservatives. Feeding Arden Grange reduces the risk of dietary intolerances and allergies that can cause digestive disorders and skin complaints. 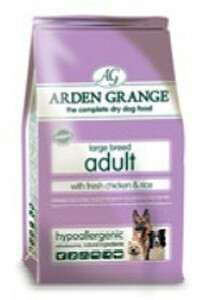 Feeding recommendations: Arden Grange LARGE BREED ADULT with fresh chicken and rice is suitable for all adult large breed dogs. Ingredients: Chicken Meal* (min 27%), Whole Grain Rice (min 26%), Whole Grain Maize, Chicken Fat, Beet Pulp, Fresh Chicken (min 5%), Dried Brewers Yeast, Egg Powder, Fish Meal, Linseed, Fish Oil*, Minerals, Vitamins, Nucleotides, Prebiotic FOS, Prebiotic MOS, Cranberry Extract, Chondroitin Sulphate, Glucosamine Sulphate, MSM, Yucca Extract, L-Carnitine. *Preserved with mixed tocopherols and rosemary extract.